When utilizing blow off products such as air nozzles, they may require mounting in such a way to give them a set direction for blowing with the additional possibility that the direction may have to be changed. But even if it does not need changing, a convenient means to set the direction of the blow off is available using the Nex FlowTM swivels. High quality stainless steel swivel fittings for air nozzles, air jets, small air knives, and air amplifiers allow for a 25 degree movement from the center axis (50 degree total movement) to aim then secure in position the blow-off application. A lock ring sets the swivel once aimed in the desired direction. If the direction needs to be changed it can be easily readjusted. 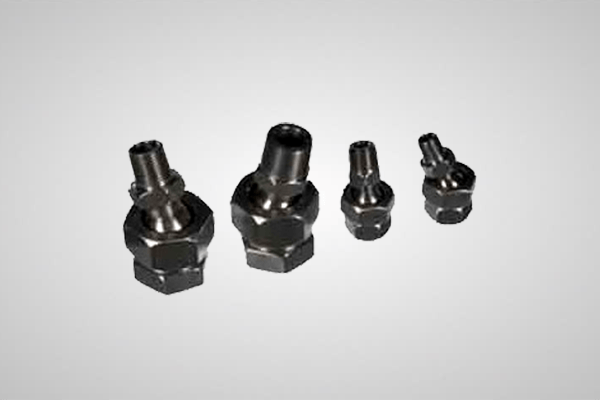 Four sizes are available with male to male connections: 1/8”, ¼”, ½” and 3/8”NPT. These swivels provide for the most rigid setting of direction for blow off products. For a more flexible approach, you can use the Rigid-flex hose.